I live in London, so my view of Toyota hybrids has been coloured by dealing with the armada of private-hire Priuses seen on the streets of the capital. Thankfully, the Toyota C-HR is a little bit different. The C-HR is a quirky crossover with deliberately different styling. Last year the hybrid version was Toyota’s second best-selling petrol-electric model, behind the Yaris. Our now-departed executive editor, Matt Burt, initially ran the C-HR, and it rarely sent him into one of his trademark Cornish rages. That gave me an idea: I’d been running our Ford Fiesta long-termer but found the boot a bit small for my photographic kit (it’s a cliché for snappers to say that in long-term reports, but it’s true), so I asked if I could swap it for the C-HR and its crossover-sized boot. I actually quite like the C-HR’s bold styling, with all those modern, angular lines. It stands out from the pack which, speaking as a photographer, I’ll always welcome. I particularly like the pronounced wheel arches and tapered lines over the rear haunch, which are offset nicely by the two-tone paint(I really liked the Nebula Blue colour and reckon the £545 metallic paint option is worth ticking). Like the Prius, the C-HR looks different, bold and futuristic, but unlike the Prius, it doesn’t bring to mind private cabs on their way to Heathrow. I also wanted to know what it’s like to live with a hybrid powertrain. I consider myself a petrolhead and I’ve been sceptical about whether a full hybrid powertrain such as the C-HR’s could be engaging to drive. But much of my daily driving is on tight, congested roads. Matt lives in Basingstoke and was using the C-HR for his motorway commute, which wasn’t showing the powertrain at its best. In the city, with stop-start driving, I hoped the system would come into its own. The C-HR’s powertrain won’t win over every petrolhead: the engine drones when it kicks in under hard acceleration, and the weight of the car means it’s never the most responsive when you put your foot down. But if you accept what the car is and shape your driving style to suit, you become more accepting. It rewards smooth, economical driving, in particular not hitting the throttle too hard in order to remain under electric power when accelerating. And once you’re on-board with that, the C-HR is a relaxing place to be. City driving in combustion-engined cars can be a clunky affair, especially if that engine is less than smooth at low revs, but the C-HR starts off under battery power and so keeps the journey smooth – so much so that it became a challenge to avoid getting on the throttle too eagerly so as not to cause the engine to kick in before it was really needed. When travelling to shoots I spend a fair amount of time on motorways, where the hybrid system doesn’t get to do so much work. The car is a reasonable cruising machine, though, and even over longer distances it encourages you to drive smoothly and efficiently. On my urban and motorway mix I averaged 51.9mpg, which is fairly decent if not ground-breaking for a car of this size. And I could hone that further, given more time behind the wheel. I wasn’t entirely taken with the interior. There was a little too much plastic dash for my liking, but there are some nicely sculpted lines and colourful accents which give a futuristic look and convey a feeling of new technology. That seems fitting for a car with a hybrid drivetrain, although I’m not sure it would work so well with the conventional petrol-engine C-HR. Still, I’ve always enjoyed Toyota’s functional approach to interior design, and it’s no surprise that the ergonomics are right and everything is easy to use. Not everything inside is quite so positive. The tapered rear window is a stylish design signature of the car but – ironically, given why I took the C-HR on – it restricts the load capacity of the boot. I found ways to cope, for example when I took three of my mates for a holiday to Cornwall, but doing so required my Tetris-honed ability to cram loads of stuff into a small space. It’s proof that not every crossover is actually any bigger on the inside than ‘normal’ cars. Anyway, by dropping the rear seats and exercising a spot of judicious planning, I was able to get plenty of equipment into the back of the C-HR, and the tinted rear windows helped hide from prying eyes anything that was left in the rear seat area. The exterior styling resulted in other compromises, such as the angular headlights, which seemed to sit low and didn’t offer the forward visibility of those on many cars. Style is a key reason you see an increasing number of C-HRs on the road, and I can now understand why. I didn’t think I’d be a massive fan of a crossover hybrid, but while the boot size might not have been quite what I signed up for, I found myself quickly warming to the C-HR. It’s calming and relaxing when quietly rolling through city traffic. I think it says a lot about a car when you find yourself adjusting your driving style to make the most of it, and I found myself doing that with the Toyota. I can definitely see the appeal – and not simply because the C-HR allows you to drive a Toyota hybrid on the streets of London without people thinking you’re a private hire driver. The C-HR’s styling might be on the edgy side, but the hybrid powertrain is all about keeping things smooth and calm. As Luc notes, to get the best out of it you have to adjust your driving style to suit. The rewards are a pleasant cruising experience and decent fuel economy. Styling It might use the same powertrain as the Prius, but I was never mistaken for an Uber driver in the C-HR. Interior Looks more expensive than it feels. Futuristic shapes and angles are appropriate given the hybrid engine. Hybrid powertrain Makes for smooth and relaxed progress during city driving – as long as you have a light foot. Load space The boot turned out to be barely any bigger than that of the hatchback I was running previously. Engine refinement When it does kick in, the petrol engine can be noisy, and it isn’t all that punchy when pushed hard. Maybe it’s because I’m driving one, but I’m noticing more and more C-HRs on the road. The more I see them, the more the styling has grown on me; it’s a distinctive look that’s so unlike anything else in Toyota’s range and far more exciting than a crossover deserves to be. While our hybrid model might share its drivetrain with the Prius, no one treats you like an Uber driver when trying to change lanes or pull out of junctions. It has made me drive a bit like one, mind. 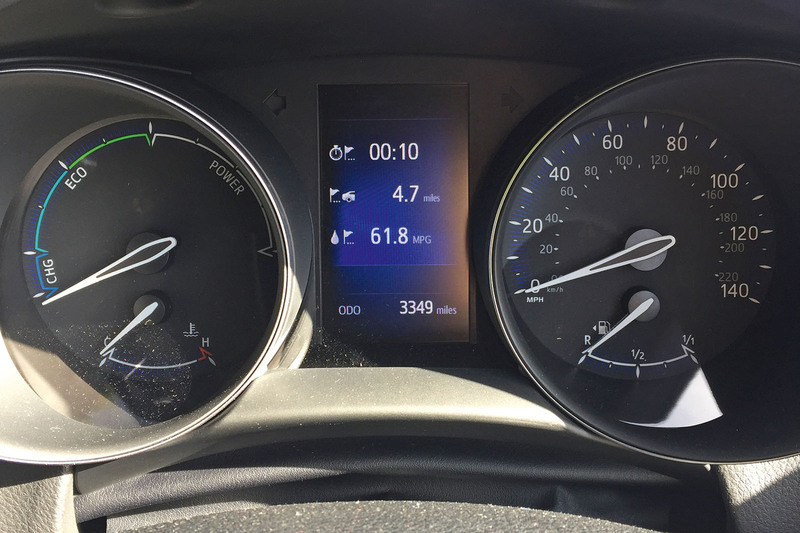 If the continually high engine revs, courtesy of the CVT gearbox, weren’t deterrent enough against flooring it away from every set of traffic lights, the instrument dials make you painfully aware the instant you’re not running on battery power. The whole point of a car like this is to be efficient, and it seems to have subconsciously persuaded me to drive it in the manner to which the powertrain is accustomed, with as little assistance from the petrol engine as possible. It has made a difference to my wallet, too: the C-HR is edging close to 50mpg, and my visits to the pumps are less frequent, despite my central London commute and plenty of motorway miles. The dramatic styling has had people asking about rear visibility, because the thick pillars and narrow windows restrict the view on the rear corners. They do get in the way a bit but I’ve not found them to be a problem, either at speed or while parking. Our C-HR came with object detection warnings, a rear parking camera and distance sensors, and all make easy work of manoeuvring. Those looks also come at the expense of cabin space, with that swooping rear end taking a fairly large chunk out of the available rear storage. But while it’s no Tardis back there, a bit of origami with the rear seats rendered the C-HR roomy enough for the ladders and camera equipment needed for our 2018 Handling Day shoot on Anglesey. I don’t usually carry this extra gear with me but ended up karting it around for a while before I could drop it back at the office, so I was glad of the tinted windows that helped to hide it from passers-by. Toyota’s unique approach to design continues inside the cabin and has earned praise from several passengers who were fans of the detailing and repetitious shapes strewn across the dashboard and interior trim. I’m not quite so convinced but am inclined to let Toyota off a few of the cheaper-feeling plastics. Given the price, it would be unfair to expect a Mercedes-Benz-level of interior finish. The built-in sat-nav isn’t the most reliable, at least when it comes to dealing with traffic. It’s usually rather optimistic with estimated journey times – often being more than 30 minutes off the mark on longer trips, which doesn’t instil a great deal of confidence when you have somewhere to be. 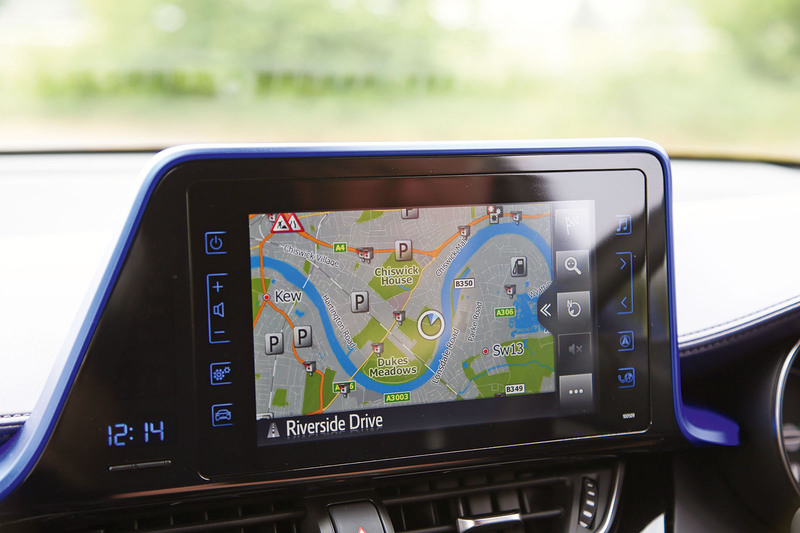 There’s no alternative unless you buy a dedicated sat-nav (or a mount for your phone), because there’s no support for Android Auto or Apple CarPlay. Toyota is adding the latter for next year, apparently. I’d definitely make the switch from the built-in system given the option. EXTERIOR STYLING Toyota has managed to deliver ‘exciting’ without stepping too far towards ‘garish’. OVERLY OPTIMISTIC NAV Traffic-aware sat-nav isn’t always as clued-up about congestion as you’d hope it would be. Packing for a multi-day photo shoot, I was impressed by how the Toyota swallowed all of my kit. Folding the split rear bench is easy even with one hand, and seatbelts don’t get trapped behind the seat like on most other cars. My only real gripe is that the floor isn’t flat when the rear seats are folded, so loading heavy, bulky items can be awkward. I’ve grown fond of the C-HR’s hybrid drive system, especially the peace and quiet you get in stressful traffic jams. The digital energy displays highlighting when battery power is being used/generated makes driving efficiently more engaging and enjoyable. Commuting in and out of Britain’s bustling capital city in silence has been a joy. It has been a fortnight of many miles and several times I’ve had cause to head to the West Country. It turns out you can learn a lot about a car when you’re stuck in a jam on the A303 at Stonehenge during holiday season and the traffic seems to be moving more slowly than the standing stones. Firstly, I’d say an electrified vehicle is the least stressful car to have under you in a traffic jam. You can just glide forward gently and silently on battery power, and the rapid response from the electric motor is useful when you have to claim a gap in the traffic as your own. As those around you simmer (you can hear them vividly when the C-HR’s combustion engine isn’t engaged) you start to appreciate other details of the car that perhaps you might have hitherto taken for granted. I’m not overly sold on the siting of the USB point, which is partially hidden when I’m looking down from the perspective of the driver’s seat, and I find it particularly difficult to fumble around for at night. Also, my iPhone 6 Plus doesn’t quite sit flat on the shelf provided for such items unless I remove its protective case. Our Toyota is also now being put to regular use as a pack horse for photographer Luc Lacey, who has cause to exploit rather more of the available stowage space than me and my coffee cup. The C-HR has 377 litres of room for luggage in the back, rising to a maximum of 1160 litres if you fold down both elements of the 40/60 split rear bench, load your gear to the roof and eject your rear passengers. Luc rarely travels light whether he’s working or adventuring, but the Toyota is proving adequate for his needs, provided he stacks carefully. During one of my journeys back from the West Country, an object was spat up by the tyre of another vehicle and hit the lower centre of the windscreen, leaving two very small divots. From the outside, they look like hardly anything at all – I tried and failed to photograph them clearly to illustrate this article, so you’ll have to look really hard – but viewed from the driver’s seat, I can distinguish two small cracks radiating out from one of the pits. I’m a born worrier, so I took the C-HR to the local branch of Halfords, which is just down the road and does windscreen chip repairs. “They’ve done a nice job on the interior” was the assessment of the Halfords chap when he sat in the driver’s seat to see the windscreen damage from my perspective. He dismissed the divots as inconsequential. Then, after we’d both been a bit distracted by his well-used Mitsubishi FTO 2.0 V6 in the car park, he said the damage to the C-HR’s screen was so slight that he wouldn’t even be able to pump in any of the resin they use to repair cracks. In an age where many sales staff are all too quick to try to upsell you a load of gubbins that you didn’t come for and don’t really need, it was a pleasant surprise to find one who was honest and a Japanese car buff, too. BI-TONE ROOF I’ve seen quite a few C-HRs without the contrasting roof and they don’t look nearly as good. SAT-NAV MAPPING I yearn for more detail of minor roads on the sat-nav map to make spontaneous shortcuts possible. I recall a car designer once telling me that ‘hidden’ rear door handles on five-door hatches weren’t great because prospective buyers could easily mistake the car for a less practical three-door and strike it off their wish lists. Mind you, Toyota has done a decent job of making an interesting design feature out of the rear handles on the C-HR. I thought I’d try to get an accurate handle on the C-HR’s fuel economy. You know what? I think it has left me even more confused than before as regards whether our hybrid Toyota is great or merely good at fuel sipping. Either that or my grade C in maths GCSE isn’t worth the paper it is written on. I tried measuring consumption over a couple of brim-to-brim fuel runs but they returned quite different figures of 47.3mpg and 52.9mpg, despite both tanks of unleaded being expended over a similar mix of M3 motorway and urban roads. Perhaps it isn’t too surprising that a vehicle that is continually switching between two power sources can return such varied results. The likelihood is that on some of the trips conducted during my tests, I would have been crawling along in heavy traffic on the M3 and using the electric motor more frequently, whereas on others I’d be zipping along at motorway speeds exclusively using the 1.8-litre petrol. The possibility of very varied fuel economy was emphasised when I made an impulsive dash to the local takeaway very late one evening. On the outward 1.2-mile journey, the C-HR recorded 73.2mpg; on the return, just 56.9. No surprise that a) there’s a long downhill on the way to China Garden and b) I was famished and wanted to get home quickly. What’s clear is that traffic conditions, road topography and driving style all contribute to getting the best out of the C-HR hybrid. Additionally, there’s still a degree of guesswork involved in the calculations, because it’s very difficult to gauge precisely how much fuel is left in the tank. I’ve usually been pumping in 33-36 litres. The C-HR hybrid has a 43-litre capacity, so when I see the low fuel warning light, there’s a reserve of about seven or eight litres. Which seems like quite a lot. Incidentally, the 1.2-litre petrol C-HR has a 50-litre fuel tank because it doesn’t need to make space for the hybrid system. As I’ve mentioned in previous reports, I think it is possible to overthink the deployment of the hybrid system. The beauty of the parallel hybrid is that you can just let it do its own thing. Since my last update, we’ve equipped our C-HR with a dashcam. Not too long ago, the numberplate of a car in my possession was cloned and I had to go through a tedious process of proving I wasn’t in the place where the cloned car was at a certain time and date. At the time, a dashcam would have provided clear evidence that I was in fact where I claimed to be. The unit we have is a Mio MiVue 788 Connect, which retails for £179.99. It records in HD and has wi-fi and Bluetooth, so you can download recordings to your smartphone via an app. It also has GPS monitoring, which logs your location and speed. Installing it was a simple two minute job and it’s a compact unit with a 2.7in touchscreen. It draws power from the 12V charging point and begins recording automatically when you start the ignition. In the C-HR, the 12V point is in the deep cubby between the front seats, so the dangling wire is less than ideal, but crucially it’s really easy to remove both the camera and the bracket from the windscreen – something I prefer to do whenever I’m parking in public areas. EV MODE LOCK Being able to lock the C-HR in electric mode for short spells at slow speeds is useful for parking and last-mile manoeuvres. GLOSS BLACK DETAILING A day at the beach involving children, ice cream and sand highlighted how easily some of the cabin materials get grubby. Now that the high-riding hybrid hatchback has been with us for more than a month, we’ve been able to subject it to some more of the ‘real world’ tests that your average family car would have to cope with. As you’ll note from the test data below, the average fuel economy has taken a slight knock now that I’m pelting up and down the M3 on my commute five days a week. On those journeys, I’m relying more heavily on the petrol engine. Obviously that’s the power source that the C-HR decides it needs to call upon for 70mph driving, but I’m at least partly to blame – being the person making the control inputs. I had hoped my driving would be sufficiently conscientious to tease the fuel economy up into the mid-60mpg region. I clearly need to become a scholar of Sir Jackie Stewart and his theory of driving more smoothly by imagining you have an egg betwixt the sole of your right shoe and the throttle pedal. On the other hand, there’s an argument that parallel hybrids such as the C-HR are at their most effective when you don’t overthink and just let it do its thing. This is especially true on those short journeys of the kind that you might undertake at a weekend when you’re doing chores – trips to the tip, the garden centre or the supermarket, for example. On around-town trips of a few miles, I’m regarding any return less than an indicated 60mpg as a disappointment. 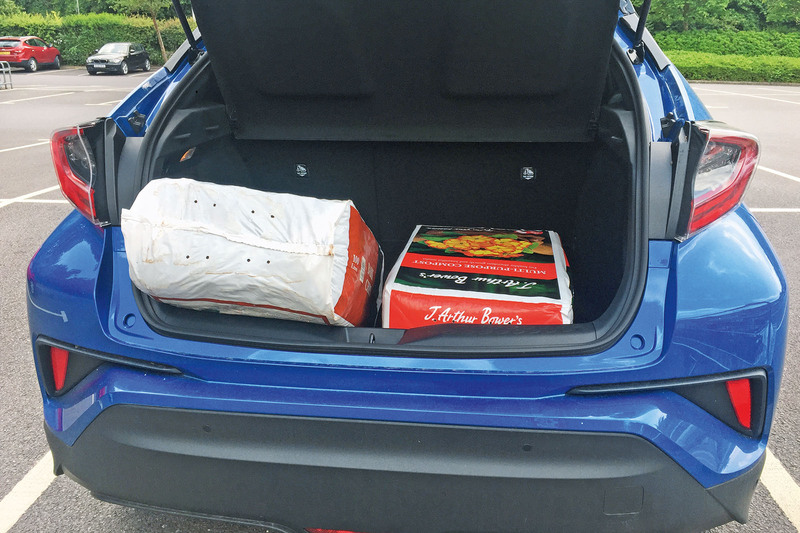 The aforementioned visit to the garden centre for bundles of peat and bark chippings did highlight that the C-HR’s boot has an awkwardly high load lip when you’re carrying cumbersome items. True, it’s not quite as difficult as the Atlas stones test in the World’s Strongest Man competition, but if a manufacturer is positioning its car as an SUV, as Toyota is with the C-HR, it needs to be fully adept at the ‘utility’ part of that equation. In a similar vein, since the five-door C-HR first arrived I’ve been sceptical about its generosity of space for rear passengers, but that’s proven to be a deception of its exterior styling, which is aimed at a coupé-esque look. It’s quite busy around the rear, with the roof and bodywork tapering towards each other and the door handles integrated into the C-pillar. Our testers weren’t impressed by rear head room when the C-HR was subjected to our Road Test (4 January 2017) but I recently carried four passengers, with the three in the rear ranging from a six-foot-plus, 15-stone bloke to an infant in a carry cot, and none had reason to complain. Admittedly one could only gurgle, but what those among them who could talk did note was wind noise. Perhaps this is a by-product of the car’s quiet powertrain making other external sounds more noticeable. More likely, though, is that by coming up with a shape that is appealing to a wide tranche of would-be buyers, and by jacking up the ride height, the C-HR’s ability to slice through the air as efficiently as its sibling, the super-slippery Prius, is diminished. Wind noise or not, I’m taking a great deal of satisfaction from cruising along on electric power at any given opportunity and enhancing the C-HR’s lifetime miles per gallon figure. You might argue (with some justification) that a considerately driven Euro 6 diesel-engined car would perform just as well in terms of frugality and that might well be true for some drivers with long and traffic-free commutes. For me, though, there are four gnarly stop-start miles at the end of my morning drive into Twickenham where the C-HR doesn’t have to rely on its internal combustion engine at all. I appreciate that won’t solve the world’s pollution ills on its own, but it does feel like a small step in the right direction. HOLD BUTTON Simple labour-saving device automatically applies brakes when you come to a halt. Convenient. SAT-NAV WARNINGS Traffic alert obscures the screen and doesn’t go away unless you press ‘ignore’. Distracting. Hunting through menus that can be shown on the digital instrument panel, I discovered you can choose a g-force meter, should the mood take you. I doubt it will. Less incongruous in a fuel-sipping hybrid is the graphic that indicates whether power is coming from the engine or motor, or whether regenerative braking is sending energy to the battery. Toyota’s petrol-electric hybrid powertrains have kept it at the vanguard of electrified car technology since the advent of the Prius back in 1997, but the idiosyncratic character of that model has been both a blessing and a curse here in the UK. Although many adopters have readily embraced the powertrain’s fuel-sipping potential, the Prius has struggled to be a car with sufficient kerb appeal for owners to want to show it off outside the school gates or the yoga class. Sure, Matt Damon, Julia Roberts and their glamorous Hollywood chums drive them, thus bestowing on the Prius a sheen of A-list approval. But on this side of the Atlantic, a gazillion minicab drivers use it, too — and, to the best of our knowledge, ‘private-hire chic’ has yet to become A Thing among on-trend car buyers. So the idea of wrapping the proven petrol-electric underpinnings in a boldly styled crossover body seems to be a shrewd one, because it gives Toyota a hybrid model that taps into the insatiable zeitgeisty thirst for slightly higher-riding, rugged-looking vehicles. They say it’s what’s underneath that counts, but maybe in the case of the C-HR and Prius it really isn’t. Both are built on Toyota’s TNGA architecture and both use the manufacturer’s latest iteration of the petrol-electric hybrid powertrain, which features an Atkinson-cycle 1.8-litre petrol combined with an electric motor, driving the front wheels via an elasticky continuously variable transmission. These aren’t the only hybrid vehicles in Toyota’s line-up in the UK; you can also get the Yaris, Auris and RAV4 in such a specification. Of them all, though, we think the C-HR looks the most dashing, especially when finished in an eye-catching metallic body colour like our test car’s Nebula Blue (a £545 option). Customers seem to agree. In 2017, the first full year on sale, 10,760 examples of the C-HR hybrid were sold, establishing it as the brand’s second-best-selling petrol-electric model behind the Yaris hybrid. We’re late to the party in welcoming a C-HR to our fleet, but we’ve not been ignorant of its appeal. When subjected to our full road test in January 2017, it elicited a solid four-star rating from our experts. Just three variants make up the UK range, two of which are powered by a turbocharged 1.2-litre petrol. The entry-level model is front-wheel drive and has a manual gearbox, and there’s also a four-wheel-drive version with an automatic transmission. But the smart money — not to mention ours — is on the range-topping C-HR with the hybrid powertrain. We plumped for a high-spec Dynamic model, which starts at £26,100 and comes with 17in alloy wheels, a reversing camera, automatic headlights and windscreen wipers, dual-zone air-con, Isofix points and Toyota’s Touch 2 infotainment system, which is based on an 8.0in tablet-style touchscreen integrated into the top of the centre console. With all that kit as standard, we didn’t feel the need to add any cost options besides the aforementioned snazzy paint. 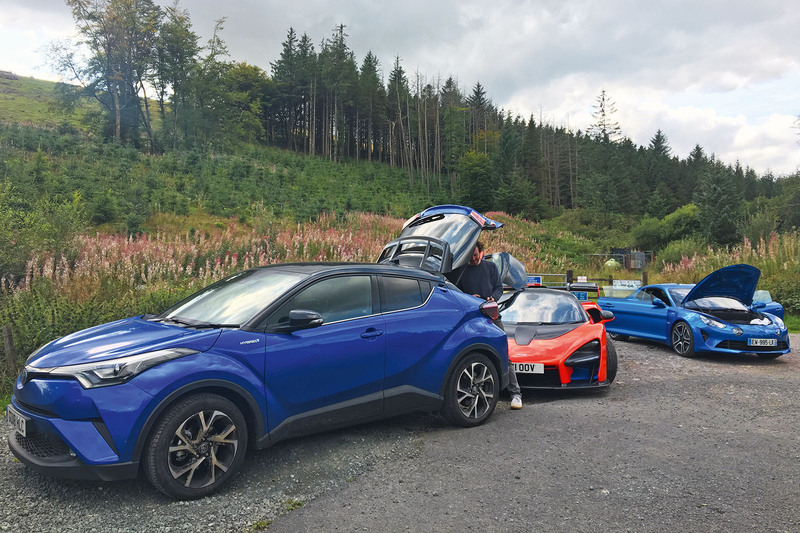 There are three key reasons why I’ve been charged with running our C-HR. First, five years ago I ran an Auris Hybrid, so I’m well placed to assess how far Toyota has moved the game on. Second is convenience. This type of low-hassle electrified powertrain, in which the engine, battery and motor are left to do their own things, suits my lifestyle more than a pure electric or plug-in hybrid because I have nowhere to install a charging point at home. Third, my varied daily journey will give the crossover a decent test. It will start and end in the C-HR’s urban comfort zone, where the slower speeds and start-stop traffic regularly bring the quiet and smooth electric motor into play, but in between the car has to endure the M3, where the petrol engine is called on more readily. Can the around-town benefits of running on electric power cancel out the need to use the internal combustion engine so frequently on the motorway? I’m quite encouraged by the early signs. Toyota’s claimed combined fuel consumption for the hybrid C-HR is 72.4mpg and the best I’ve tickled out of it so far is an indicated 60.5mpg for my 43-mile commute home down the M3. However, I’m confident that even better figures will be possible when I’m fully in tune with the driving style required to get the best out of the hybrid powertrain. A dramatic improvement over the Auris that I’ve already come to appreciate is the interior, which is a welcome change over the dour sea of black that greeted me in the hatchback. Full marks to Toyota for lifting the ambience with some bold colour inserts and some downright funky textures and flourishes. I’ll pick out some of the highlights in future updates. I’m also pleased with how nice the C-HR is to amble about in. It rides and handles rather well, with an entirely appropriate emphasis on comfort rather than any kind of misplaced sporting pretensions, and it doesn’t feel compromised by any weight penalty conferred by the electric motor and battery pack. A big thumbs-up so far, then, not least because nobody has yet mistaken me for a minicab. A car of contrasts. Edgily aggressive in exterior design (I’m less sold on the interior), yet its hybrid powertrain best suits a relaxed, calm driving style. Exercise discipline in not mashing the accelerator too often and you’re rewarded with a pleasant drive and decent fuel economy. There is a lot to like about the C-HR but when I looked at one in the showroom the back seats were claustrophobic, the rear luggage space/overall practicality disappointing and rear 3/4 visibility was awful. I'm all for Toyota creating more interesting designs, but this has come at too higher a price for me. Whilst you might be willing to sacrifce functionality for style in some cars, this is still a family car. There is a lot to like about the C-HR but when I looked at one in the showroom the back seats were claustrophobic, the rear luggage space/overall practicality disappointing and rear 3/4 visibility was awful. My impressions as well. I didn't feel like there was a lack of space, but it was pretty much like beeing seated in a panel van. Loved the looks, don't think i can live with one. I’ve been a passenger in the back of one of these. Not pleasant. Space is ok but it’s really claustrophobic and oppressive. Yes these Cars are a bit claustrophobic in the back,and, yes the view rearward is restricted, but it’ll have a reversing Camera which I think will be better than straining your Neck to look. I think it’s an image Car stylewise and there’s nothing unduly wrong with that, I like it better in this Blue most that you see are Silver or a Dark Grey. To suggest that this is a car for people who would otherwise be paying fares is, I feel, rather dismissive. Happily this seems to be just an attention grabber and the reviewer is pretty positive about the car - and seems unusually appreciative of Toyota's continuously variable transmission hybrid system. I'd liked to know how much more the Hybrid option is over the 1.2 (with same trim), It's only then you can work out if a Hybrid is worth it. LAZZZZZYYYYYY. Look at the "PRICE LIST". If it is "worth it", will you buy one?...no, thought not...still welded to the decrepit sofa. TwIT. Lazy only has one Z. FMS / Buffoon. They only do a MANUAL, Dynamic 1.2 which is £2.5k LESS. For the most accurate compare you'd want to do it against an Auto 1.2 Dynamic which they don't make. My point is how long does a Hybrid take to pay for itself, a question that Autocar never address. Had a look last year when we were replacing our SUV, spent less than 5mins in showroom. Yes it looks different (in a good way), and yes the rear accommodation is claustrophobic which given our rear seats are hardly ever used presents no problem. The #1 fault with this car tho is the boot. Not the smallest by any means but about as impractical as I've seen in a modern car. Such a high load lip, awkward shapes mean that even folding the rear seats restrics what you can carry. Hats off to Toyota for the funky design but in the design that lets the car down.